So what the heck is a pilot driver, you ask? Well, it is basically a tool that you can use to make a pilot hole, in which, to drive your line posts into the ground. As I mentioned above, if you have good soil then you will never need one. For areas, though, that have gravelly types of soil and rocky conditions, this tool will make your job much easier. First off, you are not always going to need one of these tools. In fact, if you have good quality soil then you will never need one. However, if you do have rocky ground, hardpan or hard soil from drought conditions, compaction or for whatever reason – one of these pilot drivers can save you a lot of time and hassle. They can make the job of installing line posts much easier and give you a better finished fence project as well. 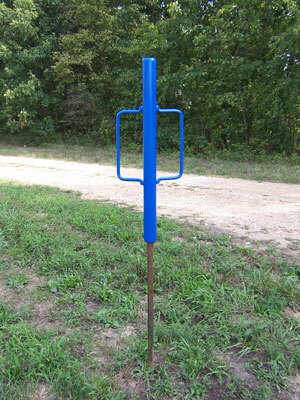 This unit is somewhat similar to a standard manual post driver, but with a spike encased within it. The spike slides within the above hammering assembly. The spike is non-removable and its sole purpose is to provide you with a pilot hole. The upper housing has enough weight to it that as you manually raise and hammer with it – it drives the spike into the ground. After the desired depth of penetration is achieved, you can then reverse hammer the spike back out of the ground. As you do encounter rocks and debris, you can give the spike somewhat of a circular motion and in most cases work right through the rocks, pushing them to the side of the hole or busting them into smaller pieces. Once this pilot hole is achieved, then it is a simple matter to drive your line post into the piloted hole. If your pilot hole is true and straight, then you will have a plumb and straight line post. I have used this tool for many different types of line posts including: composite posts, fiberglass posts and even for steel t-posts. Yes, in the Ozarks (south central US), there are places where there is so much rock in the soil that it is hard to drive in a steel t-post without drastically increasing your vocabulary and/or adding mileage on your upper torso. This creates a scenario where the post didn’t get driven in as far as it should have been, and will probably pull out at some point. Which means that you will have to go back and make a fence repair and hopefully install it right the second time. When installing composite posts without using a pilot driver first, you will notice the posts tend to bend and turn off of any rocks you encounter. Steel t-posts do the same thing. However, as we all know, with a steel post you can always bend the steel post and make it look a little more plumb. Well, with a composite post, you cannot just lean on it and straighten it up. It will flex back to the angle that you have driven it. Thus, a piloted hole will alleviate that problem. In essence, the pilot driver is chipping away and moving the rocks out of the pathway of the post. Is using this tool a fun job? Actually, it definitely is not. But the use of it is probably better than the other alternatives of fighting the hard or rocky soil conditions. And, most importantly, it will help you install plumb and straight posts rather than crooked posts that have encountered rocks and are leaning out of line. The tool itself is somewhat of a beast to lug around with you. By its own nature it needs a certain amount of heft for it to work properly. Most of them have handles on them, similar to manual post drivers. Personally, I prefer them without handles for the driving action; however the handles do make it easier to carry around. I have also seen some homemade versions of this concept adapted for hydraulic post drivers. These are usually merely spikes that are hydraulically driven into the ground with a connection point, for a chain, to pull it back out of the ground. They seem to be fast and effective devices. Here is one last comment on the manual pilot driver. It is a hand tool for making a job easier. It’s made of steel and if you are using it in rocky ground, it will be taking a real beating. Don’t expect it to last your lifetime without a few welding repairs over the years. This entry was posted in How-tos, Installation, Products. Bookmark the permalink.